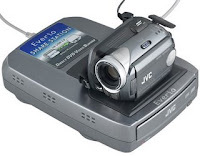 Using a hard drive-based camcorder like the JVC Everio is great if you're willing to offload your video to your PC periodically and burn it to discs. But if you don't want to deal with that -- or you're on the road without a laptop -- JVC has come up with a simpler solution in the form of the Everio Share Station, a dock with a built-in DVD burner that seems to have been inspired by the printing docks Kodak makes for its Easy Share cameras. The $200 Share Station connects to Everio G-series camcorders via USB, and allows one-button burning of videos to DVDs. It can also double as an external DVD burner for a PC.